Call A to Z Entertainment, Inc. today for free information about how to hire or book gospel musicians Walter Smith and Tru Praize. We are your best agent and top talent agency for booking and hiring Walter Smith and Tru Praize! We book and help you hire any live professional entertainment you want, to include – Gospel musicians, Gospel singers, and Gospel groups. We also help you plan and produce your show or event, so call us today at 888-655-4575 and we’ll be happy to help you. Gospel musician, director and songwriter Walter Smith was born and raised both in Baldwin and Grand Rapids, Michigan, where he inherited a love for gospel music from his dad, who is a former recording artist with the Spiritual Travelers. Walter Smith began singing in a church choir at an early age. After 7 years of studying classical piano, Walter began playing for the Sunday school department at his home church, First Baptist Church of Baldwin, Michigan and directing the youth choir in his church and later the adult choirs. It was around this time that Walter Smith came across specific recordings of James Cleveland and Aretha Franklin’s “Amazing Grace” with the Southern California Community Choir, Clara Ward Singers, Rev. James Cleveland and the Southern California Community Choir of the New Jerusalem Baptist Church. These great gospel singers and groups inspired Walter to pursue gospel music even more zealously. Shortly thereafter, Walter Smith drew inspiration from other gospel performers including Thomas Whitfield, Bethel Pentecostal Church Choir, Mattie Moss-Clark, the Clark Sisters and Keith Pringle. While attending college in Grand Rapids, Walter continued to direct and play for St. Paul Baptist Church and other choirs locally and later became a member of the Bethel Pentecostal Church of Grand Rapids, MI. At this church, Walter was baptized and began to study under the tutelage of his music mentor, the late Eld. L. Craig Tyson. Walter was also a faithful member of the Youth Inspirational Choir. Walter later moved to Detroit, Michigan where he continued to polish the musical gifts God gave him. 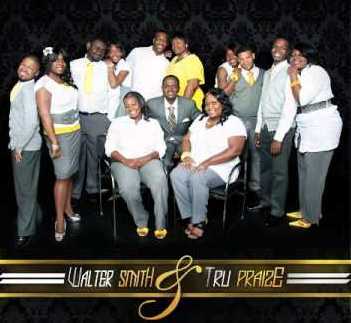 After much prayer, in March, 2009, Walter Smith and Tru Praize was manifested. On October 18, 2009, their music ministry was consecrated and prayed over during our standing room only consecration service by their spiritual advisor and Walter’s pastor, District Eld. Michael Martin. We can help you book or hire any Gospel singers, musicians, or groups. We can provide you first-rate live entertainers of any type and we’re your best entertainment booking agent for hiring Walter Smith and Tru Praize! Call 888-655-4575 today and we’ll be happy to help you. A to Z Entertainment, Inc. is not the exclusive agency for any artists on this site.